With about 30 percent of the ballots recounted on the question of legalizing the drug, 'yes' is still ahead. AUGUSTA — An official recount of a statewide ballot question legalizing marijuana in Maine is now on hold until the new year. The recount was suspended late Thursday after about 30 percent of the total ballots cast had been reviewed with no significant change in the outcome revealed. Question 1 on the Nov. 8 ballot passed by 4,073 votes – 381,692 to 377,619 – according to unofficial results from the Secretary of State’s Office. Opponents did not have to pay for the recount because the margin was so small, less than 1 percent of votes cast. The new law, which was to take effect in the first week of January, will be delayed until opponents of legalizing marijuana concede and end the recount, or until as many as 700,000 ballots from roughly 500 Maine cities and towns are recounted. As of Thursday, opponents had picked up an additional 70 to 80 votes. 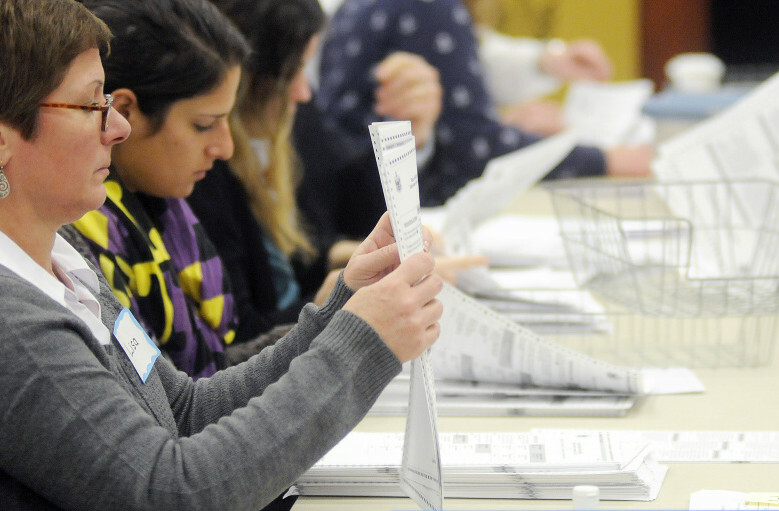 State workers and volunteers from both sides have recounted more than 200,000 ballots, including all the ballots from Maine’s largest cities, Portland, Lewiston and Bangor. The new law would make it legal for adults to possess as much as 2.5 ounces of marijuana and grow a limited number of plants. It also allows for retail stores and social clubs, which likely won’t open until 2018 because the state has to develop licensing and regulatory rules. Those supporting the ballot question voiced disappointment and frustration Friday and said they hope their opponents will concede and end the recount during the break between now and Jan. 1. Most recently, the ballots from about 30 smaller towns that the opposition wanted to review were counted, ending the second phase of the recount, which started with the state’s biggest cities. Boyer said instead of continuing to waste tax money on the recount, he hoped opponents would work to regulate legal marijuana in ways both sides have agreed on, including regulations that would require childproof packaging and other protections. “We should have smart laws that work,” Boyer said. Gov. Paul LePage said recently he believes with legal recreational marijuana the state could do away with its medical marijuana program and laws. But supporters of both legal recreational marijuana and medicinal marijuana said they are not sure LePage is serious, given that recreational marijuana would be legal only for those 21 and older, and medicinal marijuana is frequently used by minors. Boyer also said some of the protections that could limit potency or dosage amounts for recreational marijuana might not be appropriate for a person who uses marijuana medically to relieve pain or other ailments. Newell Augur, attorney for the No on 1 campaign, said it had not reached a decision about ending the recount. “We are taking a thorough and thoughtful review of all the work we’ve done to date and are communicating with all of our allies in law enforcement, the health care community and our volunteers as well as the Yes on 1 campaign and the Secretary of State’s Office in considering the next step,” Augur said. Kristen Muszynski, a spokeswoman for Secretary of State Matthew Dunlap, said it would be up to the No on 1 campaign to decide “if and how to proceed” in January.